Your smile is usually the first thing others will notice about you. 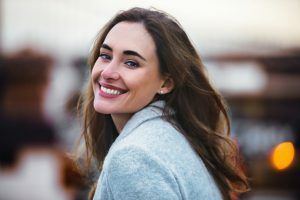 If it’s a healthy one, you have no problem showing it off, but if it is discolored, has misalignments, or shows large gaps, then smiling can become a painful experience. Fortunately, there are options. Your dentist in Long Island City, Dr. Ishwinder Saran, would be happy to help you reach your goals and restore your confidence with porcelain veneers. Veneers are custom made shells of porcelain that are designed, shaped and placed directly over the tooth. They are extremely thin and fit precisely over your smile to enhance its appearance. Veneers are made from advanced materials that mimic the appearance of natural teeth. They are an excellent option if you are interested in creating a more uniform, brighter and healthier look. Why Should I Choose Veneers? Veneers that are made of composite resin require more maintenance and can chip easier, whereas porcelain can last up to 25 years and requires no special monitoring other than normal proper hygiene. If you have severe discoloration, misalignments or malformed teeth, veneers are the best option for these types of issues. If you have teeth that are much smaller than other teeth, veneers can provide uniformity to give your smile a more natural and healthier look. Another benefit to porcelain over resin veneers is that the gums tolerate the porcelain better. The first step in the process is to sit down with Dr. Saran and discuss your unique situation and goals. At that time, your teeth and gums will be examined to make sure that they are in good condition before any cosmetic procedure is performed. A complete set of digital x-rays, photographs and impressions are taken so that Dr. Saran can design the perfect set of veneers that will look great and enhance your smile. The next visit will involve removing a small amount of enamel with local anesthetic so that your veneers will lay flat and even over the other teeth. This part of the procedure is permanent and the effects cannot be undone. Once completed, a temporary set of veneers will be placed to protect your newly prepared teeth while your permanent veneers are being crafted. The final visit is when your permanent veneers will be placed. Dr. Saran will place each veneer on, making sure the fit is perfect before permanently sealing the veneers to your teeth with an adhesive and special curing light. If you are interested in finding out more about porcelain veneers in Long Island City, please don’t hesitate to contact our office today. We guarantee you’ll never be afraid to share your smile again.